M3M Latitude Sector 65, Golf Course Extension Road Gurgaon. Call @9871424442, @9873687898 for more info. M3M Latitude new Residential Project launched by M3M Developers located at Sector 65, Golf Course Extension Road, Gurgaon. M3M Latitude offers 3 and 4 BHK apartments in 2380 sqft and 2875 sqft configurations. M3M Latitude is a limited edition offering with only 160 apartments for the discerning few. Pay 30% within 6 months+ 30% on Completion of Super Structure (approx 3years) +Balance on Possession (approx 4 yrs). The Project is spread in 2 Acres of land comprises of single Iconic High Rise Tower of Stilt+42 storey with Limited Edition 160 Apartments. 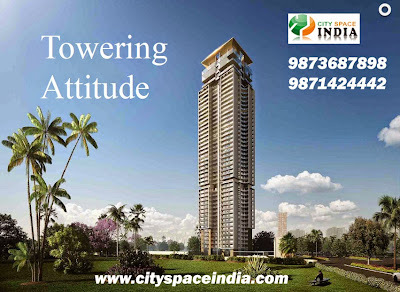 As the name "LATITUDE" the Tower of Growth indicates - it is a concept which is upscale and sophisticated. The physical elements of 'Height' are strongly emphasized along with modernity and a certain "Techno- style". This essentially connotes a neo-minimalist, futuristic design, evoking a sense of steel greys, cool water, blocks and avant-garde sculptures. The Project boasts of High End Rooftop Crystal Club & Lounge Spread over 41st, 42nd & Top Floor. "M3M LATITUDE" will have first roof-top lounge in Gurgaon with 360° Observatory Deck Circle with Giant Telescope where U can not only see the whole City/Surroundings from 450 Ft Height but can go for Observation for terrestrial or Celestial Events. · Situated on 60 metre wide main arterial Sector road. · Highly Efficient Architecture Planning and Design, Modern Contemporary Architecture; Designed by UHA, London. · Energy efficient VRV/VRF air-conditioning system for Living, Dining & Bedrooms & Double glazing for energy saving and peaceful living. · European styled cabinetry Modular Kitchen with Hob, Chimney, Polished Granite counter with SS sink and CP faucet. · High End Single lever, International Brand CP Fittings & White sanitary ware. · Rooftop Crystal Club & Lounge with Gymnasium, Squash court, SPA, Jacuzzi, Steam, Sauna etc. · Resort-style Pool area and large Deck. · Bedroom with Plastic Emulsion with Roller Finish walls, Imported Laminated wooden flooring, Polished Flush Shutter with Wooden Door Frame & Double glazed; UPVC/ Aluminum Glazing windows. · Intelligent Home Access Control system & Laundromat. · High rise with beautiful external lighting in the building. & All around – all apartments enjoy abundant natural light. · Gated 3 Tier Security System with 24x7 power & 100 % power back up round the clock with suitable diversity and load factor. Parking Charges (per Car Parking Bay) 2 Car Parks are mandatory for 3 Bed Room Apartment & 4 Bed Room Apartment.